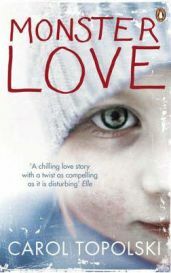 Monster Love is a story centred around married couple Brendan and Sherilyn Gutteridge. A couple who are soulmates in every sense of the word, and totally wrapped up in each other. They both have great jobs and have climbed the ladder at the same firm where they met, and live in an expensive house and have expensive tastes. To the outside world, they are a couple so in love, and they keep themselves to themselves. However, are always very polite to everyone they meet. The only time they appear to socialise is when attending or holding work-related dinner parties, drinks parties etc, where they are always attentive and polite. The perfect couple it seems. That is until Samantha is born. For Brendan and Sherilyn, Samantha is just a thing that threatens to spoil their perfect love. At first , the neighbours often see Samantha with her parents, but then when no one in the neighbourhood has seen Samantha for quite some time, a puzzled neighbour decides to take action. Yet Brendan and Sherilyn seem happier than ever, so nothing is wrong. Is it? I found this a very strange book to read. From reading the back cover, and right from the very first chapter it is obvious something has happened to Samantha, so I am not giving away any spoilers here. It has an unexpected structure, in that each chapter of the book features a different person’s perspective of the Gutteridges’, their lives and the events that happened. The story slowly unfolds, drawing the reader in as we discover each person’s perspective. There are also some chapters where the Gutteridges’ themselves also tell their story. There are numerous characters in this book, ranging from Charlotte, the neighbour who is the first person to suspect something isn’t right, to Kaye, the social worker who realises just how gullible she can be and has a hard time dealing with it. Other characters who feature in the individual narratives, are the Gutteridges’ parents, work colleagues, and professionals involved in the events which happen. Because only a chapter is given to each character, you would think that this is not enough for the reader to be able to grow to like, or identify with the characters involved. Therefore I did think at first, I would not enjoy reading the book, and that it would be ‘all over the place’, is the phrase that sprung to mind when I began reading. However, this is where the author has excelled herself, as I found the characters were really well-developed in each chapter, and you found out not only their thoughts, but also a little of their own lives and backgrounds too. It was all woven together really well, with just enough time given to the characters own lives and personalities to interest the reader, but also to ensure the story did not stray too far from the plot. The author herself is a practising psychoanalytic psychotherapist, which no doubt explains why she is able to describe the thoughts and feelings of the characters so well. The story is described as a chilling love story with a twist, and I would go along with that to a point, however, you are told early on in the book exactly what happens to Samantha, so I was expecting a twist at the end, and for me it didn’t happen, as I had guessed the ending quite some time before the end of the book. I also found towards the end of the book it takes a turn towards becoming strange and macabre, which I found a little unbelievable. However, even though I found it a little strange, I am not doubting this could happen, as I am not a psychotherapist! The story is very disturbing, and although the reader is spared any real, in-depth description of what Samantha endured, it still makes for a dark and harrowing read, as it also becomes apparent that the Gutteridges’ lead far from normal childhoods themselves, which may explain some of their actions. Because of the revelations from their own childhoods, you find yourself switching from hating them as they do not seem to realise that they have done anything wrong, to having just a little bit of sympathy and understanding. All of which leads to the question – are monsters born, or created? Overall it is a tale of obsessive love with terrible consequences, and you realise from the start that there is never going to be a happy ending. If you think you can bear the subject matter, then you will enjoy reading this book as it is has a unique style, and is very well written and thought-provoking, despite the strange ending letting it down a little. No Comments on "Monster Love"
« Jack The Ripper – Case Closed?